“Total revenue generated was N503.7bn representing a performance of 78 per cent; total recurrent expenditure was N281.33bn representing a performance of 92 per cent, while total capital expenditure was N387.60bn or 76 per cent performance,” the governor said. Ambode said that the state was entering into the New Year with confidence of being on a solid prosperity footing, with interesting prospects for all Lagosians. He said it was gratifying that the support of the people enabled government to achieve a lot and commence the transformation of the landscape of the state. Ambode listed some of the key projects delivered last year to include the new Tafawa Balewa Square Bus Terminal, new Ojota Pedestrian Bridge, Aboru-Abesan Link Bridge and adjoining inner roads. He cited others as Ojodu Berger Slip Road and Pedestrian Bridge; Jubilee Bridges in Ajah and Abule Egba; Freedom and Admiralty Road in Lekki; new Lands Registry; newly upgraded Jubilee Chalet in Epe, among others. Giving a report of activities of his administration in the last quarter, Ambode said the state government commissioned the first state-owned DNA Forensic Centre. He said that in the coming weeks, he would sign a contract to upgrade the facility to offer toxicology services. “In fulfilment of our promise to our students in tertiary institutions across the state, this administration disbursed a total sum of N635.5million to 8,419 students across the state. “Our government acquired healthcare equipment worth N2.5 billion. “The equipment will strengthen the capacity of our health facilities to render improved health services and also facilitate smooth take-off of the Lagos State Health Scheme, which is designed to enable residents enjoy unfettered access to qualitative healthcare,’’ he said. Giving an outlook on 2018, Ambode promised that he would sustain the momentum of development and vigorously pursue all ongoing projects, with special focus on health and education. The News Agency of Nigeria (NAN) reports that in the 2018 Appropriation Bill of N1.046 trillion awaiting approval of the House of Assembly, the state government has earmarked N92.676 billion for health, representing 8.86 per cent. The state also earmarked N126.302 billion for education, representing 12.07 per cent of the budget. Ambode assured the residents that the state government, in the coming weeks, would pay compensation to all those whose structures gave way for construction of the 1.4 kilometre Pen Cinema Flyover/Bridge. He said the government would also pay compensation to those affected in Igbogbo, Ikorodu, Owutu and other areas where construction activities were ongoing. The governor, who entertained questions from residents, ordered the Public Works Corporation to immediately move in to fix bad roads in Computer Village, Abesan Estate, Oriade, Abule-Egba, among other areas. 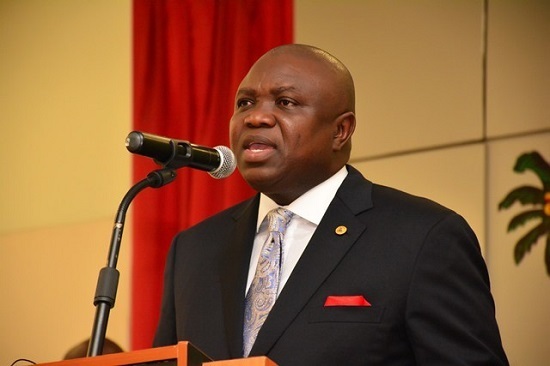 Ambode also revealed that the Market Development Board would be inaugurated in coming weeks. He expressed optimism that when functional, the board would address issues of market relocation for developmental projects, just as he said that the Onikan Stadium would be ready in January 2019. Ambode urged all taxpayers to be alive to their responsibility of fulfilling their obligations to the state, saying regular payment of taxes remains the major source of funding infrastructures.